Every time I notice a comment from someone arguing against cloaking affiliate links, I just have to wonder how well this person understands the risks of raw links. Writing this post allows me to drive home some points without making an enemy unnecessarily. I just want people to understand the importance of taking every possible precaution to protect your business. Just as we lock doors, use strong passwords and associate with trusted people for very good reasons, we must take every precaution to protect the information contained in every affiliate link. You might be a wonderfully trusting person, but there are too many unscrupulous scoundrels who refuse to respect the property belonging to others. Instead of waiting for something expensive to happen, consider these important reasons to cloak affiliate links on websites, in emails and everywhere you use the unique links for your business. Protect Commissions – In my early days online, I had wondered why link cloaking was so important. One experienced person told me that he had numerous examples of 30 percent loss in commissions with raw affiliate links. Imagine losing a full third of your money because a competitor actually stole your link. You might not believe there are people like that in your business life, but would you want to lose 30 cents of every dollar before you took action? Build Credibility – For some unknown reason, shoppers are less likely to follow an encrypted affiliate link that seems to point to a dangerous location. All of us have ended up on sites that do have trap doors that can place your computer at risk of viruses and malware. Affiliate networks create cryptic links in hopes that the information inside is protected. Your site visitors will feel more comfortable following your link if the official site name is in your cloaked link. Mask Affiliate IDs – Although many affiliate networks have hidden the affiliate ID from the link, you will want to protect those links. Unfortunately, some people are not playing the game according to the rules. Maybe you do not think like a common criminal, most of us don’t. You will want to take every precaution to cloak your links to remove all risk of losing your affiliate relationships. Avoid Ranking Penalties – Search engines contain algorithms that look for raw affiliate links. Sites with those links on webpages will be knocked off the first page of search results. Everyone knows that an affiliate ranked below that first page is out of the money. Cloaked links will not be noticeable to the search engines when rankning your site. Use Links on Social Sites – Most of the social networking sites sell advertising for people to buy in order to tell others about products and services. Anyone who inserts a raw affiliate link will have a difficult time having posts viewed in the newsfeed of Facebook. On another note, Twitter will simply close any account that violates their terms of service. Competing with their revenue streams is not tolerated. Cloaked links are not noticeable to all the filters. Evade Ad Blockers – Some of your customers might have ad blocking software to prevent unwanted ads from overwhelming every webpage. Your cloaked links can be used on banners when you download the image and host the banners on your own sites. Placing your banner ads directly on your site while attaching your cloaked affiliate link is the best approach for ensuring that your ads are always displayed. Easily Change Links – No one can overstate the advantage of updating all of your links with one simple change. Imagine the amount of time it would take to find and change all of your cloaked links when one offer evaporates because the product was discontinued. Your valuable traffic on an offer can be redirected to another offer with similar features and interests. Track Link Stats – Your strategic approach to link cloaking can offer insightful information when you clink the same link multiple times for easy tracking. Placement of your links will determine how much interest each cloaked link draws. Statistics will provide useful data for you to make decisions. Any links that are completely ignored can be replaced with other products or offers that are interesting to your visitors. Improve Link Performance – Trusted links are more likely to be clicked to bring visitors, and potential buyers, to your websites and affiliate offers. Whenever people see links that have indefinite destinations, they are more likely to leave and find another option. Cloak your links and watch your click-through rates improve. 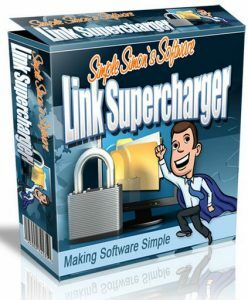 Enhance Search Rankings – Backlinks to your sites will have more pull when you install Link SuperCharger on your site with the domain name that you want to rank. More backlinks from your site create more link juice from various locations, such as social media, blog entries and anchor texts on authority sites. Every time I see a raw affiliate link, I want to share these important points with the people who are blissfully ignorant of the risks. Please, share this information with everyone who needs to know the importance of taking the time to cloak affiliate links. Be sure to use my most trusted link cloaker – click on the image – and get your copy right now! Cloak my linksLink Cloaking SoftwareWhy cloak affiliate links?